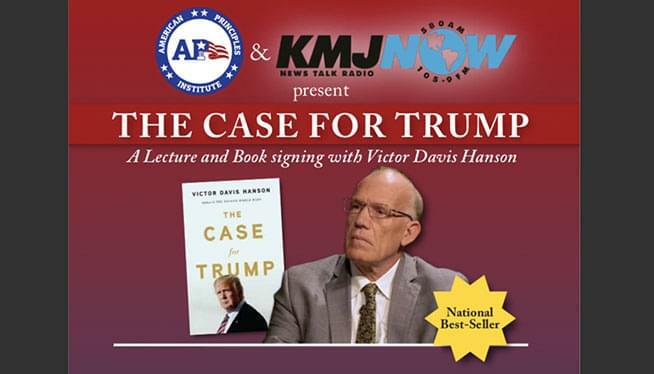 KMJ 580/105.9 & The American Principles Institute are proud to present a night out with conservative, classicist and world-renowned military historian Dr. Victor Davis Hanson! Hanson’s latest best-selling book “The Case for Trump”, will be the focus of a lecture and book signing at Tornino’s Banquet Hall on Friday, April 19th. Doors open at 6pm. Lecture at 6:30pm. The event is sold out! “The Case for Trump” is a national best seller and has risen as the #1 book outlining the conservative reasons for supporting the Trump Agenda. You will not want to miss this great event as Dr. Hanson will not disappoint with his timely analysis of recent events, including the Mueller investigation. API and KMJ are proud to sponsor this stop on his National Book Tour and help support our valley’s own preeminent scholar. Sponsorship packages are available that includes signed books and reserved seating. Contact Preston Little at 559-978-0902 for all the details.